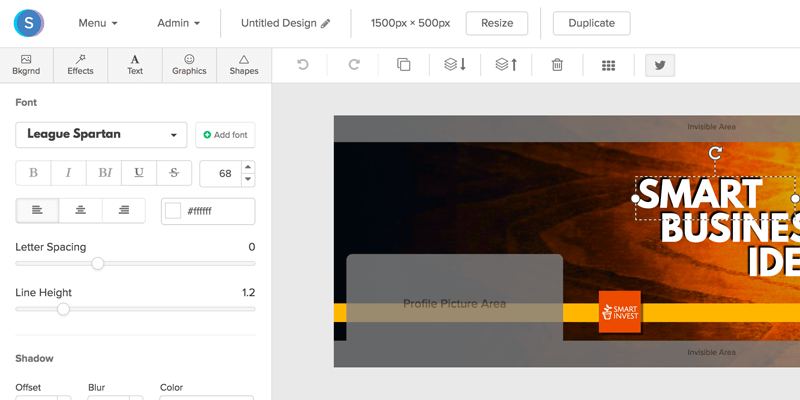 Snappa’s free header maker is loaded with stunning templates, high-res images, and everything else you need to make professional looking Twitter headers. Photoshop makes header design a chore. First you need to figure out the proper image dimensions that account for Twitter’s profile picture and invisible areas. Then you need to spend hours learning the software and navigating through a maze of features you’ll never use. Twitter headers should be updated regularly. But when you’re dealing with graphic designers, you need to wait for your request to reach the top of their to-do list, and that’s if you can even afford a designer. Repurpose Twitter headers for your other social media profiles and vice versa in a couple of clicks. Pump out your next Twitter header in seconds with Snappa. "Snappa is the best tool I've used to create images for Twitter. In 5 minutes I can do what used to take me hours to do or pay designers to do." 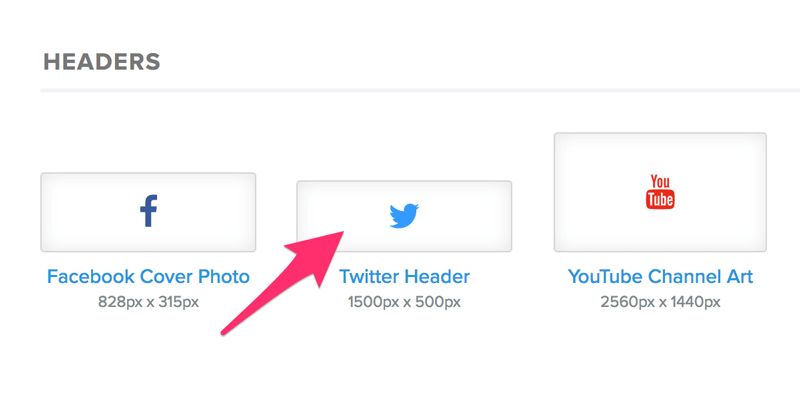 Click on ‘Twitter header’ to start with the perfect image dimensions. Choose from a bunch of easily customizable Twitter header templates to save time and look like a pro. Or, start from scratch to unleash your inner creative. Download your new Twitter header and upload it to Twitter. It will fit perfectly and customers will think you hired a professional graphic designer. 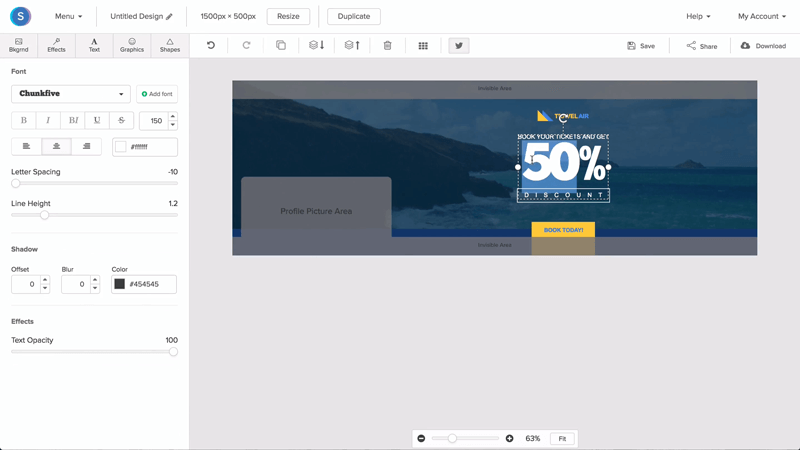 See why 100,000+ entrepreneurs and marketers choose Snappa to create stunning Twitter headers. What’s to love about Snappa’s header maker? Twitter header dimensions are available as a preset. A single click creates a canvas suited for Twitter header design. Of course, if you want to create graphics for other platforms, we include dimension presets for social media posts, social media ads, blog images, and display ads. And image resizing makes it dead simple to repurpose an image for all other platforms. 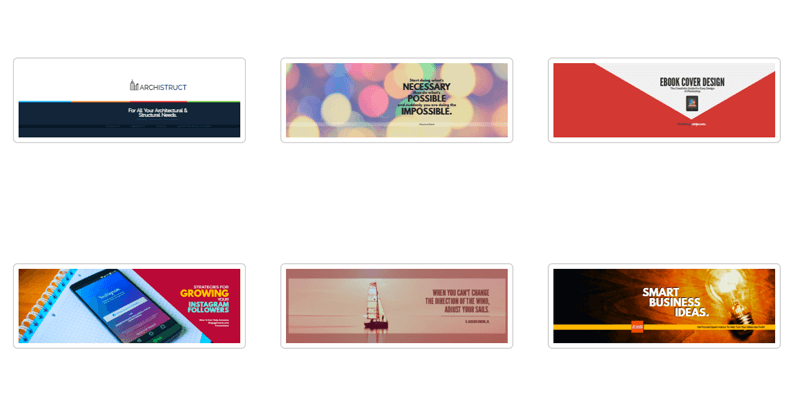 In a couple of clicks, you can turn Twitter headers into Facebook covers, Google+ Covers and other graphic sizes. You don’t always have time to dream up a 100% original Twitter header. 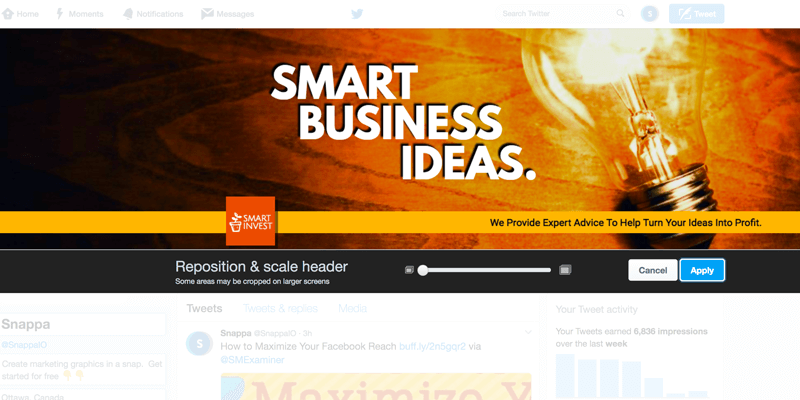 With Snappa, you have access to professionally designed Twitter header templates. Now you can be confident that your visual elements are well-proportioned, that your text elements are balanced, and that your colors complement one another. And you can customize everything about a template to make it match your vision and brand. Change the color of graphics, shapes, text, and overlays with a single click or by entering a hex code. This makes it incredibly easy to create on-brand headers. We have eliminated the learning curve you have come to expect from graphic design tools. You can create your first attention grabbing Twitter header and upload it to Twitter within minutes of signing up. Courses, lengthy tutorials, searching through help documents, and talking to support are not required to use Snappa like a pro (free help is available if you need it, though). Snappa is made for the entrepreneur, blogger or marketer who needs to create professional looking graphics and then get back to their real work. Create Twitter headers to show off your brand, advertise a sale, and to feature new products and services. You can use Snappa for as long as you like without paying a dime. You have access to thousands of photos and graphics, professionally designed templates for Twitter and all other major social media platforms, and 5 shares and downloads per month. Even our most powerful time-saving features such as automatic image resizing are yours on the free plan. We only want you to consider a paid account when Snappa becomes an important tool that saves you a ton of time and headache each month. Is Snappa only for Twitter header design? Ready to create your next Twitter header?